UPDATE: The introduction to this post may seen a little “out there”. For some context, I had just finished watching the South Park Black Friday episodes prior to writing this post so I definitely had some inspiration regarding zombie shoppers, Black Friday chaos, and Game of Thrones. Hordes of angry shoppers. Stampedes of middle-aged midwestern women, their toothless gums bloodthirsty for 75% off the latest season of Game of Thrones at the local Wal-Mart. They’ll lineup outside the Wal-Mat doors on Thanksgiving at midnight. They’ll rally, beating at the locked doors with their hands and heads until their bodies are raw and bloody, like zombies from 28 Days Later. But instead of human flesh, they crave petty consumer sustenance. Their war cries of discounts and sales will reach the heavens. And their thunderous footsteps will cause earthquakes across the Great Plains. Of course, the media won’t help — they will sensationalize every last little piece. From frostbitten families camping out all night in the blistering cold, to the little old lady trampled by raging bargain hunters as the doors open, akin to the Gallimimus stampede in Jurassic Park. All of this simply because she wanted to purchase the latest Halo game for Timmy, her little 9 year old grandson, who’s parents passed away this time last year. At a Wal-Mart. During Black Friday. And I have to ask, is all this chaos and bedlam worth it? Any shopping I do this Black Friday will be from (safely) behind my laptop screen, likely nursing a hangover from the night before with a cup of coffee and a handful of Tylenol. Imagine how silly you would feel, standing in line, waiting to checkout, only to scan the barcode on the latest season of Game of Thrones only to find out that Target has it for $5 cheaper? 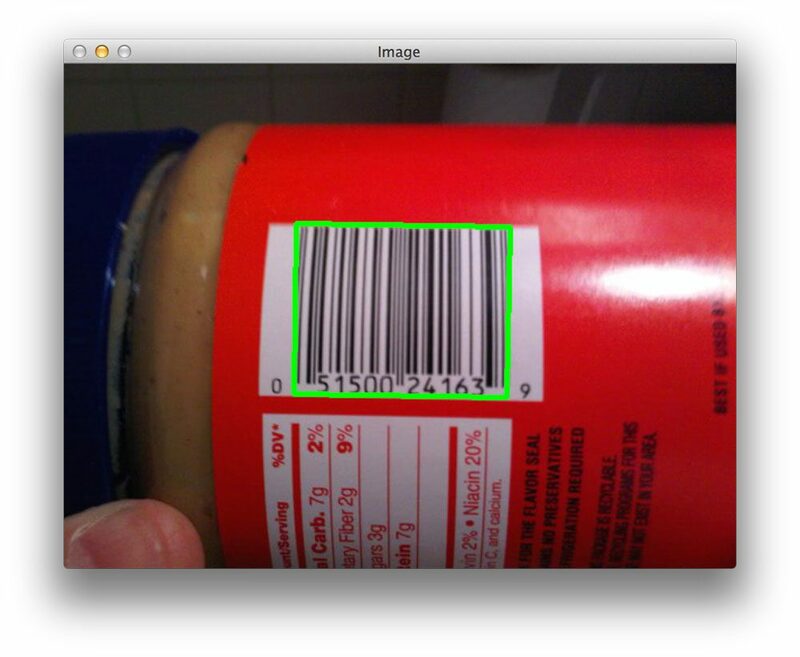 In the rest of this blog post I’ll show you how to detect barcodes in images using nothing but Python and OpenCV. 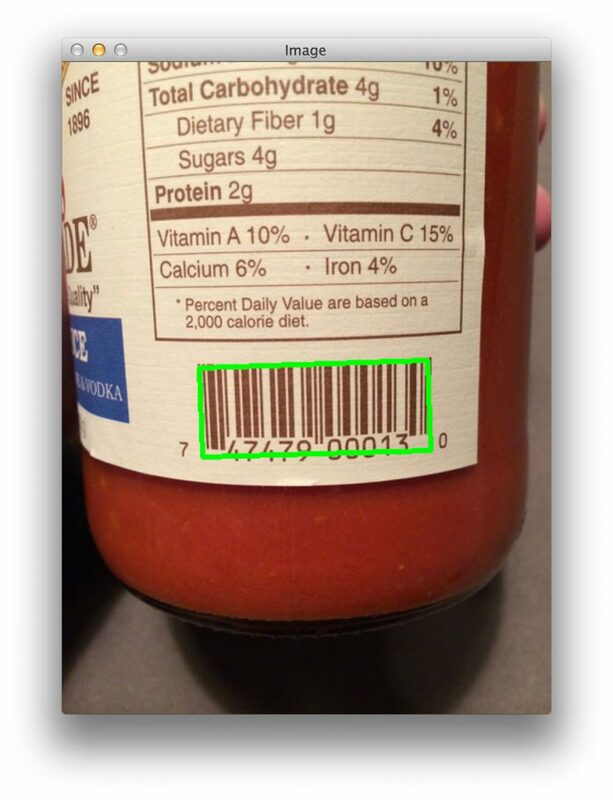 The goal of this blog post is to demonstrate a basic implementation of barcode detection using computer vision and image processing techniques. My implementation of the algorithm is originally based loosely on this StackOverflow question. I have gone through the code and provided some updates and improvements to the original algorithm. It’s important to note that this algorithm will not work for all barcodes, but it should give you the basic intuition as to what types of techniques you should be applying. Figure 1: Example image containing a barcode that we want to detect. The first thing we’ll do is import the packages we’ll need. We’ll utilize NumPy for numeric processing, argparse for parsing command line arguments, and cv2 for our OpenCV bindings. Then we’ll setup our command line arguments. We need just a single switch here, --image , which is the path to our image that contains a barcode that we want to detect. On Lines 14 and 15 we load our image off disk and convert it to grayscale. Then, we use the Scharr operator (specified using ksize = -1 ) to construct the gradient magnitude representation of the grayscale image in the horizontal and vertical directions on Lines 19-21. From there, we subtract the y-gradient of the Scharr operator from the x-gradient of the Scharr operator on Lines 24 and 25. By performing this subtraction we are left with regions of the image that have high horizontal gradients and low vertical gradients. Figure 2: The gradient representation of our barcode image. Notice how the barcoded region of the image has been detected by our gradient operations. The next steps will be to filter out the noise in the image and focus solely on the barcode region. The first thing we’ll do is apply an average blur on Line 28 to the gradient image using a 9 x 9 kernel. This will help smooth out high frequency noise in the gradient representation of the image. We’ll then threshold the blurred image on Line 29. Any pixel in the gradient image that is not greater than 225 is set to 0 (black). Otherwise, the pixel is set to 255 (white). Figure 3: Thresholding the gradient image to obtain a rough approximation to the rectangular barcode region. We’ll start by constructing a rectangular kernel using the cv2.getStructuringElement on Line 32. This kernel has a width that is larger than the height, thus allowing us to close the gaps between vertical stripes of the barcode. We then perform our morphological operation on Line 33 by applying our kernel to our thresholded image, thus attempting to close the the gaps between the bars. Figure 4: Applying closing morphological operations to close the gap between barcode stripes. Of course, now we have small blobs in the image that are not part of the actual barcode, but may interfere with our contour detection. All we are doing here is performing 4 iterations of erosions, followed by 4 iterations of dilations. An erosion will “erode” the white pixels in the image, thus removing the small blobs, whereas a dilation will “dilate” the remaining white pixels and grow the white regions back out. Provided that the small blobs were removed during the erosion, they will not reappear during the dilation. Figure 5: Removing small, irrelevant blobs by applying a series of erosions and dilations. Luckily, this is the easy part. On Lines 41-44 we simply find the largest contour in the image, which if we have done our image processing steps correctly, should correspond to the barcoded region. We then determine the minimum bounding box for the largest contour on Lines 47-49 and finally display the detected barcode on Lines 53-55. Figure 6: Successfully detecting the barcode in our example image. In the next section we’ll try a few more images. To follow along with these results, use the form at the bottom of this post to download the source code and accompanying images for this blog post. Struggling with running the code in this section? Take a look at my command line arguments blog post. Figure 7: Using OpenCV to detect a barcode in an image. No problem detecting the barcode on that jar of coconut oil! Figure 8: Using computer vision to detect a barcode in an image. We were able to find the barcode in that image too! 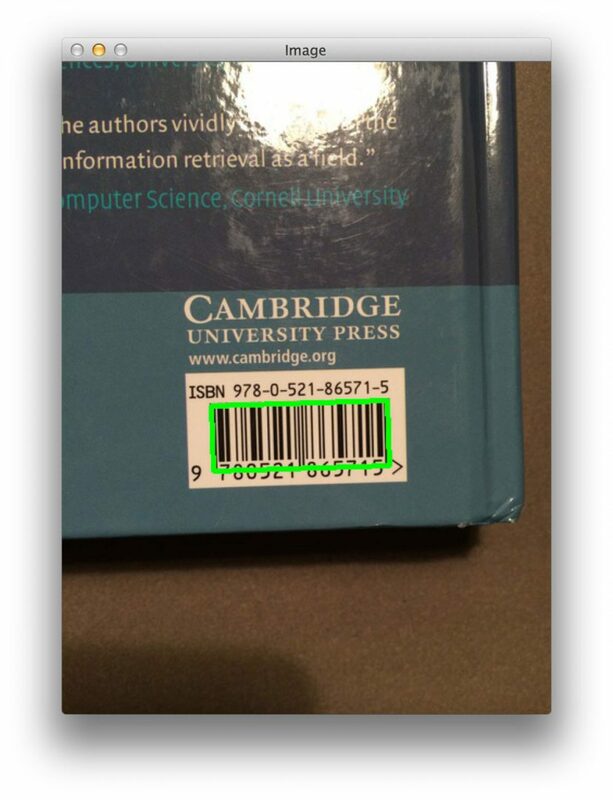 Figure 9: Detecting a barcode on a book using Python and OpenCV. 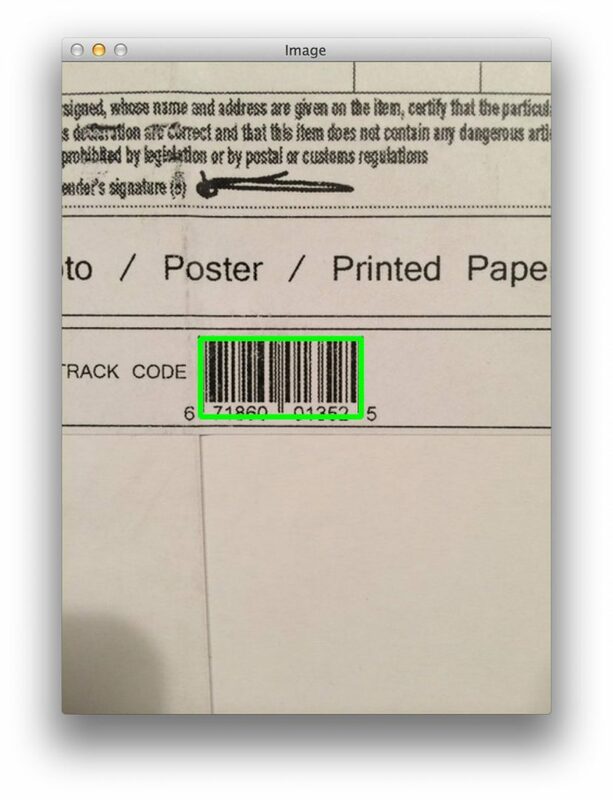 How about the tracking code on a package? Figure 10: Detecting the barcode on a package using computer vision and image processing. 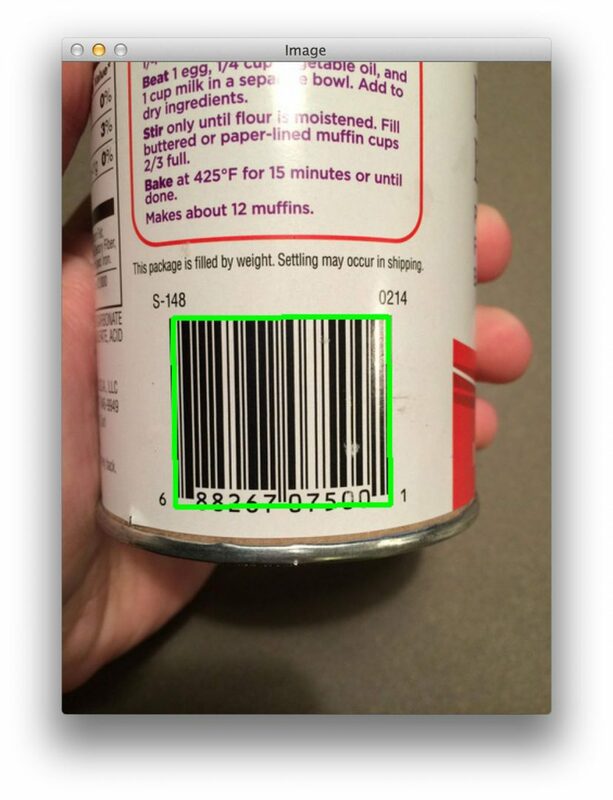 Again, our algorithm is able to successfully detect the barcode. Figure 11: Barcode detection is easy using Python and OpenCV! We were once again able to detect the barcode! In this blog post we reviewed the steps necessary to detect barcodes in images using computer vision techniques. We implemented our algorithm using the Python programming language and the OpenCV library. Compute the Scharr gradient magnitude representations in both the x and y direction. Subtract the y-gradient from the x-gradient to reveal the barcoded region. Blur and threshold the image. 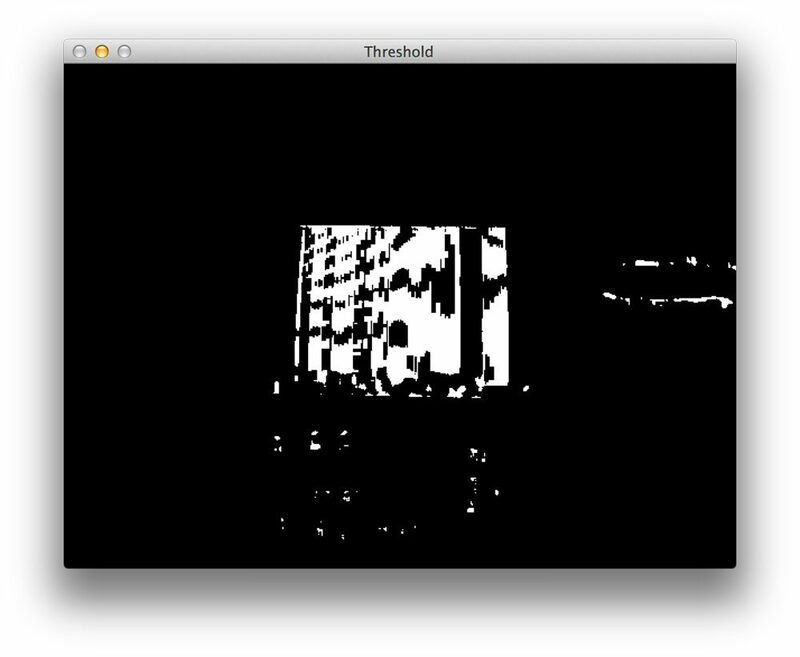 Apply a closing kernel to the thresholded image. Perform a series of dilations and erosions. Find the largest contour in the image, which is now presumably the barcode. It is important to note that since this method makes assumptions regarding the gradient representations of the image, and thus will only work for horizontal barcodes. 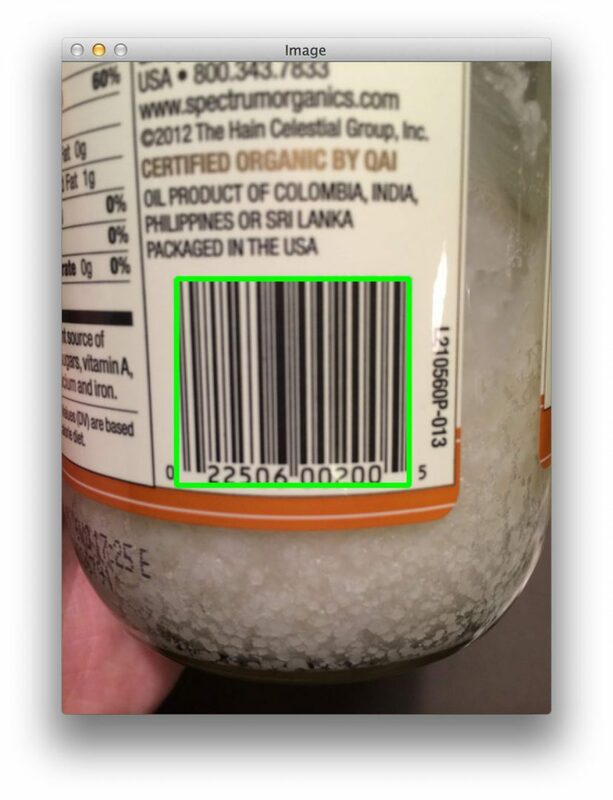 If you wanted to implement a more robust barcode detection algorithm, you would need to take the orientation of the image into consideration, or better yet, apply machine learning techniques such as Haar cascades or HOG + Linear SVM to “scan” the image for barcoded regions. Hi Brandon, thanks for the reply! I’ll definitely consider doing a followup post on deciphering barcode values. If so, I’ll definitely give that a shot next time! Hello, good job on making the article I think its quite useful. Only thing is your zombie reference is a bit out. Its 28 days later 😛 not 24 days later. Other than that its a brilliant article. Whoops! My mistake — can’t believe I messed that one up. It’s fixed now! Nice article. But please don’t combine alcohol and tylenol (paracetamol). Even when you’re hungover it’s really very bad for your liver. Sorry for being off-topic. Terrific post, thank you. I am trying to adapt your code for use with pdf417 barcodes and then decipher the actual codes. Any ideas on what modules / commands to use? Hi Fran — I’m not familiar with PDF147 barcodes but I’ll try to do a barcode reader tutorial in the near future. This will be great. PDF147 barcodes are in passports and identification cards. Can you make this possible? Would be cool to see this done with streaming video. Hi Jason, damn, that’s a great idea. I see a followup post coming! (1) Is using a scharr operator than a sobel crucial to this problem? (2) In your explanation “By performing this subtraction we are left with regions of the image that have high horizontal gradients and low vertical gradients.”, do you mean LOW horizontal gradients and HIGH vertical gradients? Because that’s how they named vscharr and hscharr in skimage. (1) I don’t think it’s crucial. But the Scharr operator is more accurate for a 3×3 kernel, that’s the reason I used it. Realistically you could use the Sobel operator as well, I don’t think it would make an impact. (2) Interesting. I’ll have to take a look at that. and since you are further making “convertScaleAbs” then all the high negatives will become high positives, so you end up with an image in which high vertical and low horizontal gradients are also emphasized. Which isn’t what you say you want (you want only the high horizontal and low vertical gradients). Another remark related to the above is that in figure 2 (for example the finger) we can see that he image contains all combinations of high gradients- high horizontals, high verticals, and also gradients in 45 [deg]. Hi Niv, shoot me an email and we can chat more about your question. Thanks! Thanks for the article! I’ve been playing with OpenCV in Google Chrome Native Client, and put together a version of this post that works in (Chrome) browser. Wow, thank you for posting this tutorial. I was wondering, if it’s possible to somehow save the coordinate location and barcode image size? Sure, absolutely. The line box = np.int0(cv2.cv.BoxPoints(rect)) will give you the (x, y)-coordinates of the location of the barcode and the barcode size. From there, you can store the coordinates on disk, in a database, etc. Your articles are good and informative. However, I would like to mention what I perceive as a shortcoming, and this applies to many of your articles. And that is, instead of diving right into code which you seem to have a tendency of doing, I think it is much better to describe in words the algorithm and what you are trying to do. In this case, it would be the characteristics of the barcode region you’re trying to detect. You have something which is almost similar in the summary, but it should be even more general and at the beginning. As an example, the article link you provided about how QuaggaJS works is much clearer in this regard, I find. Right in the beginning introduction, the author says we are looking for a barcode region with “lines which are close to each other and have a similar angle”, and then proceeds to describe steps and details. It’s much clearer that way. Diving into the code without knowing what you’re looking for is confusing. Again, this is meant as constructive criticism. Thanks. Your job is very good and significant,but it can only detect barcode,if it can recognize the barcode in the picture,it will be better. Changes I made: optimized for vertical barcode; added centring offset to the restructuring element as the final box was shifted up and to the left; experimented with the thresholding to get reliable results in my images; extracted the actual barcode as a bitmap to make reading easy. This is cool. Have you come up with how to extract the barcode value yet? Hi John, using the code above you can most certainly extract the barcode from the image. Do you mean actually recognize the barcode? If so, I probably won’t be covering that directly on the PyImageSearch blog. There are a lot of other resources online that cover the encoding schemes of barcodes far better than I could. Notice how the --image switch points to the barcode_02.jpg file in the images directory. Please read up on command line arguments and you will be able to resolve the issue. Notice how the path separator has been changed. Hello, great article. Btw is the procedure to detect 2D barcodes (PDF417) similiar ? I mean for 2D barcodes horizontal gradients wont be comparatively high to vertical gradients, right ? Can you do a followup on this ? Any idea why that might be the case? Hey Al, it sounds like you are using OpenCV 3.0. This code was developed using OpenCV 2.4. Change ddepth=cv2.cv.CV_32F to ddepth=cv2.CV_32F (along with the following line for the y gradient) and you’ll get ride of the pesky error. They seem to have updated so now instead of cv2.cv.CV_32F it’s just cv2.CV_32F. Thanks for the great post! I tried it and it worked from the first time, but i was wondering is there a way to get the value of the barcode? Great question. There are a lot of barcode reading packages out there. I would start by looking into zbar. Excellent post and enjoying the e-books too! Just a quick (and I’m sure, easy) question. How difficult would it be to extend this to include multiple barcodes in a single image? Like if you have to catalog a monotonous amount of barcodes but don’t really want to scan each one at a time but would rather line up about 5-10 barcodes and extract those contours? It wouldn’t be too challenging to extend to multiple barcodes. Instead of taking the largest contour as I do on Line 40, just loop over them individually, ensure they have sufficiently large size, and continue to process them. How to crop the barcode region out of image? (x, y, w, h) = cv2.boundingRect(c) on the contour to grab the bounding box of the barcode. 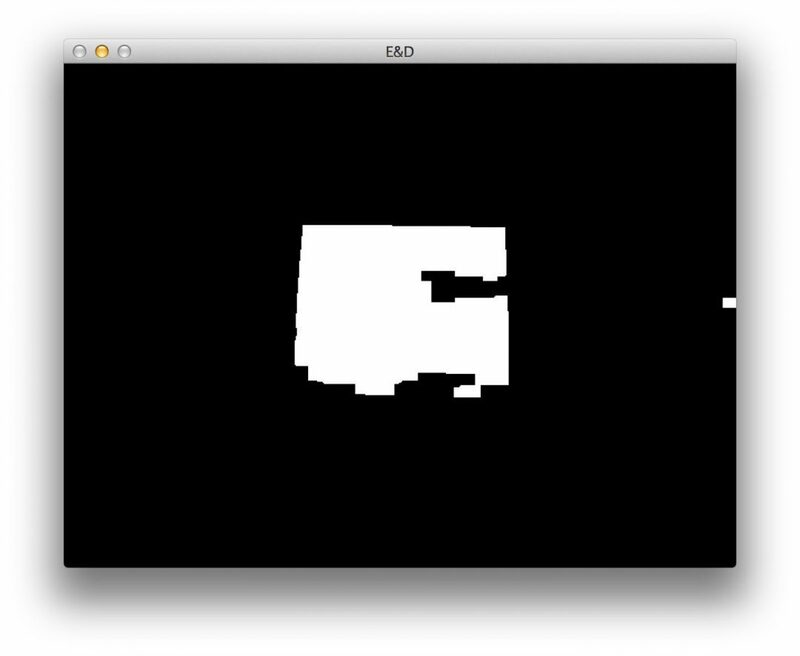 From there, you can extract the region from the image. Hi Shoo — you can extract a region of interest (ROI) using NumPy array slicing. This is covered in Practical Python and OpenCV + Case Studies in Chapter 4. Is there a way to compare two different bar codes to check if they are similar? Sure, there are multiple ways to do this. I would suggest starting with MSE and SSIM. do you have something similar for detecting QRCodes? I don’t have any tutorials related to detecting QRCodes, but it’s certainly something I’ll consider in the future! I personally haven’t tried decoding the barcodes themselves, but I would recommend using a library such as zbar. I also trying to decode Barcode in opencv and python.But didn’t get any idea how to do it. Can you tell me if you get it. Coming in late but I would recommend to use ZXing. Been using for some time now and my colleagues and I are very happy with it. @Adrian, great post! Really useful. Thanks Kevin, I’m glad it helped! And thanks for the recommending on ZXing. Hello!!!! You’re the very best Adrian. Is it possible to the same steps in C# .net? Yes, but you would need to convert the code from Python + OpenCV to C# + OpenCV. So we cant use for OpenCV 3 ? This blog post was written before OpenCV 3 was released. That said, change cv2.cv.CV_32F to cv2.CV_32F and (cnts, _) = cv2.findContours(closed.copy(), cv2.RETR_EXTERNAL, cv2.CHAIN_APPROX_SIMPLE) to (_, cnts, _) = cv2.findContours(closed.copy(), cv2.RETR_EXTERNAL, cv2.CHAIN_APPROX_SIMPLE) and the script should work just fine. How can I convert it to c/c++ “np.int0” what is equavalent of this code in c? I also converted the python-code to C++ a few days ago. Hopefully correctt cause I don’t know python. 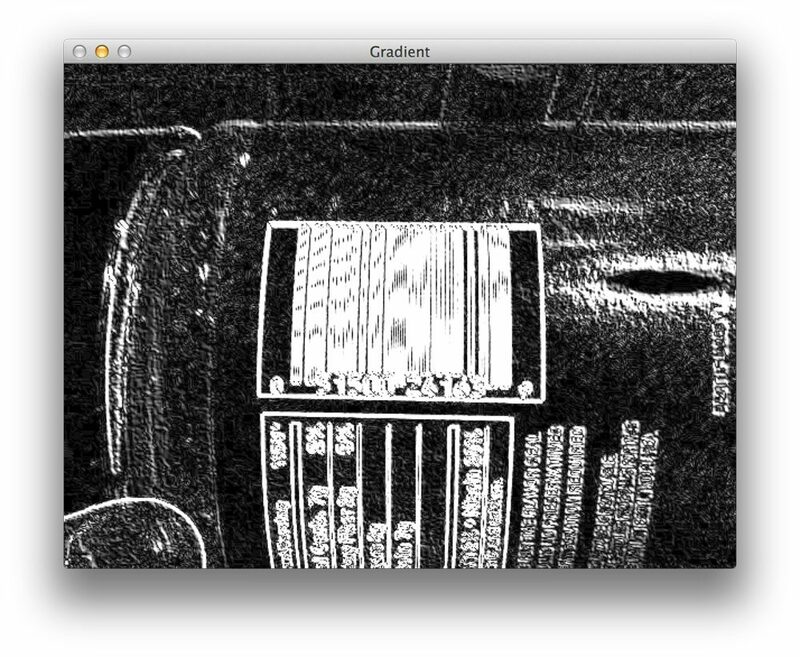 However the barcode detection with the 6 Test-Images seems to work fine. To your Question: In C++ it is possible to avoid the function-call “cv2.cv.BoxPoints(rect)” nad to use the cv::RotatedRect-Method points() instead. The Result of that method call is a cv::Point2d-array which has to be casted into a cv::Point-Vector. That cast-operation is what “np.int0()” apparently does. I’ve done that cast-operation in a simple for-loop – line 146 in the below link. If you find any problems with the code, please let me know. Can you provide a source where I could find the tutorial to decipher the bar code? That would be great! I don’t have any tutorials covering barcode decoding (yet), but I would suggest using zbar. You need to supply command line arguments to your script. Before continuing you need to read up on command line arguments. cv2.drawContours(frame, [box], -1, (0, 255, 0), 2), it fails with a exception. error: (-215) npoints > 0 in function drawContours. As I understand the box must be a array of arrays. Even if I exchange ‘[box]‘ with ‘box’ in function call, it fails with same exception. So if I understand correctly, you computed the bounding box and now you are trying to draw the rotated bounding box on the image? I successfully completed the steps. Now i want to get the numbers from the barcode. What to get that? Take a look at the zbar library. I personally haven’t used it but I know other PyImageSearch readers have liked it. Thanks. Can you suggest some? Whats interesting is that the results (the rectangle marking the barcode) differ from opencv 3.2.0 to 3.3.0 with opencv 3.2.0 also not finding the barcode. I tested python 2.7 and 3.6 with both opencv 3.2.0 and 3.3.0. Maybe you could revise this tutorial given you have time to spare. Hi! I am a python beginner.I tried implementing your code. Ran into a error at c=sorted(…). The index list is growing out of bound. How can this be corrected? Thank you! Thanks for this article, it is really helps me to solve my solution. But I have problem while detecting barcode with black background. In this case it works a little bi incorrect. So when I change thresh parameter from 225 to 175, 150 or even 100 , it recognize barcode with black background, but with this parameters it works incorrectly for others images. Could you please recommend some advise how to solve this issue? Have you considered applying adaptive thresholding or Otsu’s automatic thresholding? This would be my first suggestion. how to resolve this error ? Always check the comments for your error. Please see my reply to “Em” on June 22nd. HI! Where in this code, that part of it, where it is determined that we should write down the area where the barcode is found (strips and digits)? Hi Saldor– Line 44 gets the coordinates for the box. Let me know if this helps. Hey Hoda — are you testing on your own images or the images included with the download of the blog post? Make sure you use the “Downloads” section of the post and test with the original images to obtain a baseline first. It sounds like no barcodes are being detected in your input images and thus the script automatically exits. it does not showing the right barcode it just showing half part of 4,5 barcode image file. and also i need to make an application to make the for droesiness detection but i cannot having dlib oin windoes so can you help me please. I would suggest doing research on facial landmark detection libraries that can be used on Windows. For what it’s worth, dlib can be installed on Windows. This article is really nice. However, I had a question. How would you justify that the barcode region will have the highest x gradient value? What about the background words in the sentences, even they’ll have a high gradient in the x-direction right? We subtract the y-gradient output from the x-gradient output. This subtraction leaves us with regions of the image that have high horizontal gradients and low vertical gradients. A barcode will exhibit lots of changes in the horizontal direction. Hello! Nice article and very informative. However I have a question. Thank you for all the posts. I have a few doubts. 1. Could you tell the difference between cv2. MORPH_CLOSE and cv2.MORPH_OPEN arguments. Exactly why do you use the MORPH_CLOSE argument here and what would happen if instead MORPH_OPEN is used? 2. Could you elaborate a little more on Lines 17 and 18 as to what they do with the image? 1. These are morphological operations. A close will “close” the gap between foreground objects while an “open” will expand the gap between foreground objects. I cover morphological operations inside my book, Practical Python and OpenCV as well as the PyImageSearch Gurus course. 2. These lines compute the Sobel gradient magnitude representation of the image. Again, see Practical Python and OpenCV or the PyImageSearch Gurus course. This can happen when the barcodes are near the boundaries of the image. We’re converting a contour region to a bounding box and if the barcode is near the boundaries of the image you can have a negative value. If you’re new to Python and command line arguments that’s okay but make sure you read up on them first. Hey Haili, this is indeed related to how the cv2.findContours return signature changed between OpenCV 2.4 and OpenCV 3. I’ll be updating this blog post work with OpenCV 3 soon (it was written before OpenCV 3 existed). When I run this on python 3.6 I’m getting a ValueError on the cv2.findContours line. I know this may not have been written for python 3, but do you have any tips on how to get it working? This is my first time using cv2 so I’m not sure what/how many values findContours returns. I’ll also be updating this blog post to support both OpenCV 2.4 and OpenCV 3 in the next couple of weeks. PS. Don’t know why, but a blur gradient of (6,9) worked better for me – otherwise it was picking out just two bars – might be because it was a short-wide label with rounded corners? Thank you for your efforts – keep ’em coming! hi Adrian if i run the code its just scanning the barcode. what iam asking is if i scan the barcode it should detect and print it on the terminal can u tell me how to do this? This tutorial will solve your exact problem. Thank you for your useful article. I did it successfully, but I want each barcode returns a real value in order to save as a product. 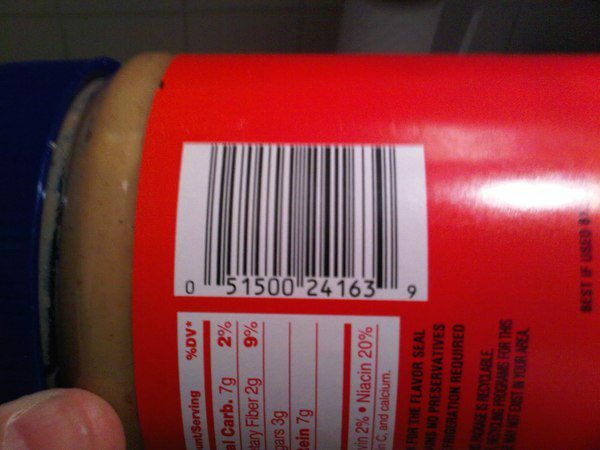 Whenever I read a barcode, I can know what the product is. Could you pleased to guide me how to do it? Sure, see this tutorial to read barcodes. Hi, Adrian. Great job for the barcode detection. Do you have any idea of the name of algorithm you used? or the author? Thank You. There isn’t really a name for this algorithm. It’s something I created for the sake of this tutorial. the images must have a especific resolution? What it is the resolution of the images that you used? And about the ambient ilumination, is there any especification? For a more robust barcode detection you may want to use the Zbar library. See this tutorial for more information. I’m doing a project for blind peoples so they can use they smartphone to scan barcode realtime and transform it into sound via text to speech. The challenge for blind peoples is they can’t see where exactly the barcode location. I’m using your algorithm and the result is good, but whenever there is the nutrition fact, it’s detect the nutrition fact as barcode too. Do you have any idea how to fix it? Thank You. What a great project! Have you tried using this tutorial which leverages the ZBar library? That will likely work better. I am going to detect LP code(Lots perception Matrix code) in scanned image. The images was damaged. How can I do?